Backwoods Home Magazine. Articles on the theme of Living the Outlaw Life appear in the bi-monthly print 'zine and on the Web site. Sierra Times. New Hardyville columns appear monthly in the Members-Only section. My new book, Think Free to Live Free: The Political Burnout's Guide to Life, Activism and Everything. It's published by Breakout Productions and available from Breakout's parent company Loompanics Unlimited. (And soon) the book I'm co-writing with Aaron Zelman of Jews for the Preservation of Firearms Ownership. It's called The State vs. the People: The Rise of the American Police State. Visit the The JPFO Web site to watch for its publication date. From both the underground and the "respectable" press. The most passionate, and often the funniest, writer on the Internet. Sometimes serious, sometimes funny, always with a commitment to freedom. They wrote so much good stuff we had to put the older pieces into a separate archive. Claire's books, lots of others' books. Eclectic choices. Buy books here and earn Wolfe's Lodge The MegaBucks. By live guys and dead ones. "Sound-Off" used to be a regular feature of the Lodge. Now we're just archiving these short opinion pieces for your reading pleasure. Wolfe's Lodge is dedicated to the writings of Claire Wolfe, Patricia Neill and other lovers of liberty. It is also dedicated to all people who choose to be free, rather than wait for others to free them. 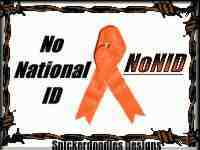 Join the Orange Ribbon No National ID campaign! Make your Web page a Bill of Rights Enforcement site! NOTE TO FEDERAL AGENTS: If you're just digging for dirt, please read this. If you're a real person who cares about freedom, Stay and be welcome! I hope you enjoy our work. was rendered by Michael Haggard. Wolfe's Lodge has had visitors. Copyright Notice - The documents distributed by this server have been provided by the contributing authors as a means to ensure dissemination of their work on a noncommercial basis. Copyright and all rights therein are maintained by the authors of these documents or by other copyright holders, notwithstanding that they have offered their works here electronically. It is understood that all persons copying this information will adhere to the terms and constraints invoked by each author's copyright.